The gastronomic specialities of the Costa Blanca are one of the biggest attractions for many tourists who love dining out in local restaurants of such popular places as Torrevieja and Orihuela Costa. There are plenty of delicacies to be discovered in the many bars and restaurants located near the Costa Blanca beaches. Let us show you a few examples. 1. Coming in at number one has to be the delicious "paella". The ingredients include rice, seafood, tomato, green beans, chicken, artichokes, olive oil, saffron, salt and water, among others. Diners traditionally eat from the outside edge toward the center, spooning the paella directly out of the pan. Don´t forget to try the burnt rice at the bottom. 2. "Tapas" are the best thing to nibble on as you toast with your glass of wine or beer in a Spanish bar. These small, delicious portions of traditional Spanish food can be enjoyed any time of the day and come in so many different forms and varieties. 3. Toast with "Jamón Ibérico". This never leaves anyone disappointed. The Iberian Ham is produced exclusively in Spain and made from a famous and a legendary race of Spanish pigs called Black Imperial pig. The Ibérico ham is an expensive one and has become widely known all over the world. 4. Dates wrapped in bacon. This popular combination is very easy to prepare and will make an ideal treat when having guests at home. Dates are wrapped in bacon and then cooked on the grill until the bacon is crispy. 5. 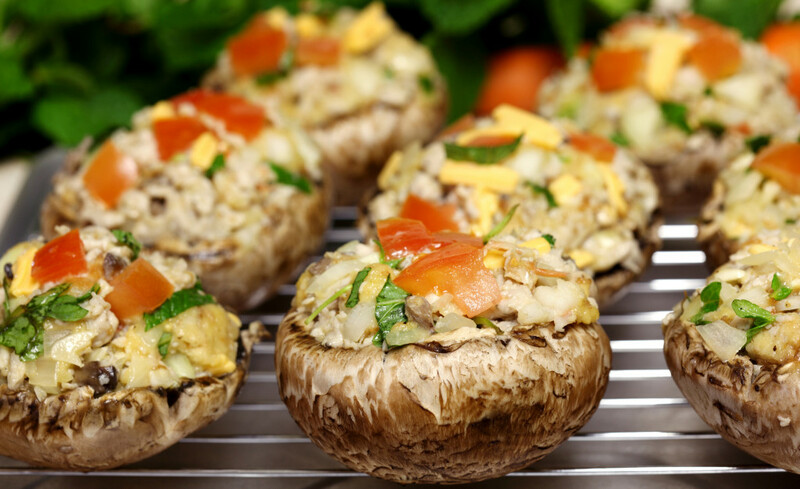 Stuffed mushrooms. These are really easy to prepare and simply delicious to the taste. The button mushroom tops are removed, then the mushrooms are filled with olive oil, garlic and bits of Iberian ham and left to cook on the grill. A typical Mediterranean style dish usually served with plenty of fresh bread to mop up the savoury juices. You will get to enjoy all of these exquisite foods and more when you buy a property on the Costa Blanca!